The Church Web Works team has been working with churches, ministries and missionaries for almost 20 years. Back in 2001, Gavin Fysh and his brother Steve created a website for Steve's church. The website had to be 2 things, powerful enough to do what the church wanted and easy enough for their staff to work with. And with that, Church Web Works was born. Whether you are knowledgeable or new to technology, you will love Church Web Works. No experience is needed and you will enjoy building an amazing website for your church with our easy to use tools. The software is written from the ground up for the church, built for you! You can be up and running with a great church website in 4 easy steps and a few fun hours of work. Best part is our team of experts will help you throughout the process of your site build. They are not paid on commission and truly LOVE our customers. Sign up for your 30 day free trial. Free trial of the software is fully functional and includes all of our beautiful designs, features and our All-in Customer Care. Start building your website. To begin, pick a design from one of our modern designs. All of our designs are fully customizable and responsive. The layout of web pages adjust dynamically, taking into account the screen size of the device (desktop, tablet, mobile phone). Enter content. Add pages, events, and images. Our software makes it simple to easily add content, videos, audio and images to your site. Have any questions? Give our All-in Customer Care a call or sign up for one of our FREE Church Web Works university classes here. Website is done, and you are ready to go live! Just give our All-in Customer Care a heads up. They will help you launch the new website and make sure that Google finds it. Now you can sit back, take a break and enjoy a job well done. The Northwest Ministry Network is delivering a better experience for its churches. 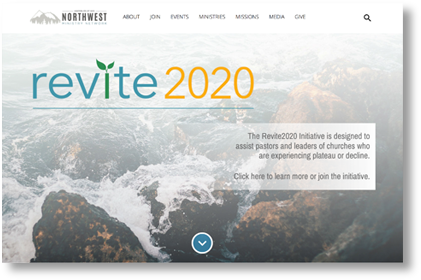 The Pacific Northwest Assemblies of God district office is using Church Web Works to communicate its message better, stream media and enhance registration for large district-wide events. 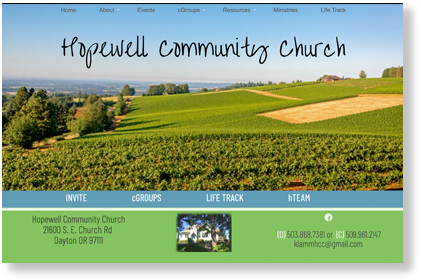 Hopewell Community Church, located northwest of Salem in a rural family community, is made up of of folks from various spiritual background that focuses on connecting people. They communicate a Christianity that isn't rocket science, but rather a place to belong and to explore what it means to give Jesus the steering wheel of our lives. They love the commitment of Church Web Works to Christ and ministries, both large and small. They recommend the easy to use format and the availability of training for others in the church which saves their pastor time. or an independent church or ministry, we are here to help. We consider it an honor to serve you as you serve others. Here's a sampling of the various denominations we've worked with over the last couple of decades. Of course, there are many, many independent or non-denominational churches in the Church Web Works family as well. We know each church and ministry is unique, so no matter where you are, we hope you'll let us help you build a site that reflects your members and your mission. Our customers are connecting with their communities. Here are just a few ways that connection is happening. Click to learn more about these stats, and what this info means to churches and ministries just like yours.